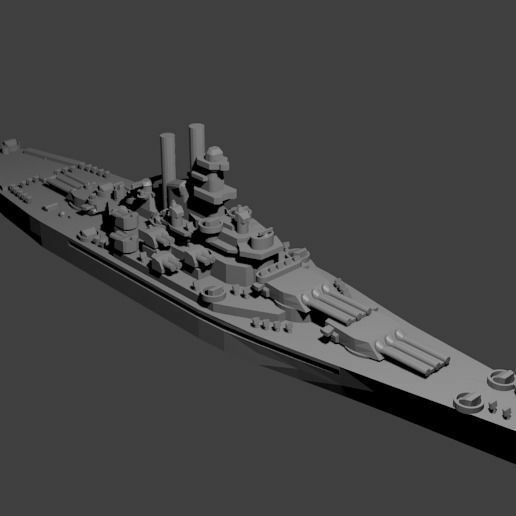 1/1800th scale Sims Class Destroyer model. Certain elements not to scale. The US Sims class consisted of twelve destroyers built between 1937 and 1940. Seven were lost during the war. They were designed with five five-inch guns and twelve torpedo tubes, but many were refit by removing one of the five-inch guns in favor of four fifty-caliber machine guns as well as dropping four of the torpedo tubes. This model is designed and tested at 1/1800th scale, but up-scaling and down-scaling are possible. Since the model is optimized for 1/1800th scale, it is not ideal to print much larger versions due to a lack of detail. The gun barrels and mast have been enlarged.